By TLex Here you can see Oris brand ambassador, Carlos doing a free-diving demonstration in Madrid with Oris of Spain. Carlos set the Guinness World Record for apnea while he was wearing an Oris watch in Los Cenotes, México. 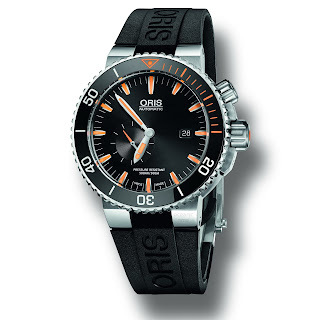 He can be seen here wearing his own latest Oris CARLOS COSTE IV . . .
Like ORIS? Check out the new bronze Oris CARL BRASHEAR Limited Edition and Aquis Great BARRIER REEF Limited Edition II watches . . .
Hi. I don' know if will be aware of this, but the reason for the visit to Madrid of Carlos Coste was to attend an event in which a donation was given by a foundation named Respiralia that works with children with cystic fibrosis .In this event a very special and unique in the world clock also give, as was wear by Carlos Coste when he broke the Guinness Record in 2010.I am the lucky winner of that watch and wondered if he would publish a post in such event, because I have lots of pictures and watch some of event. Please tell me how i contact you to talk about this. Hi there, thank you! That is very interesting! Please feel free to email me at oceanictime@oceanictime.net or contact through FB.